The University of Essex loves to collaborate with business and is now the leading university in the East of England and London for Innovate UK’s flagship Knowledge Transfer Partnership (KTP) scheme. Innovate UK confirmed at a special celebration event hosted by the University of Essex that more companies and organisations are working with Essex on KTPs than any other institution in the South East and South West regions - including the capital. Companies attending included leading global businesses such as BT, Fläkt Woods, LPA Connection Systems and Leonardo through to innovative SMEs like Dicam Technology, Glowinkowski International, Mondaq, Objective IT, Profusion and Signal Media. 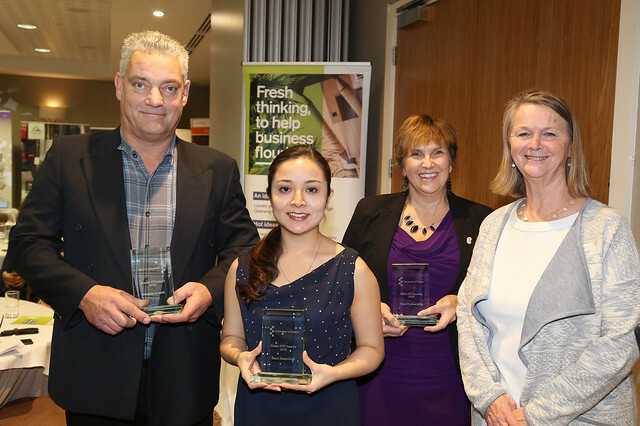 Essex graduate Dr Anasol Peña-Rios, based at BT’s global research and development centre at Adastral Park in Suffolk, was named Best KTP Associate on the night. Multi-award winning Signal Media, based in London, which won last year’s ‘Best of the Best’ award from Innovate UK, was announced as KTP Partnership of the year. The award for Best KTP Academic went to Dr John Woods from the School of Computer Science and Electronic Engineering for his work on multiple projects across a number of fields including agritech with Suffolk-based Dicam Technology, the Internet of Things with Essex-based Raytel Security and multiple collaborations focused on drone technology. "We are determined to take our KTP work even further in the coming year"
KTP Manager at Essex, Rob Walker, said “We are a business-facing, research intensive university with strategic aims to continue to develop long lasting collaborations with industry. These are mutually beneficial, and the structure and funding of a KTP offers a lower risk approach for businesses looking to innovate and scale up. KTP is an established world-leading programme that helps businesses to innovate by connecting them to the UK's wealth of academic resources. It's a partnership between the business seeking expertise, a university and a high performing graduate - known as the Associate - who base themselves full-time at the company. A project can last between 12 and 36 months and is part-funded by a grant from Innovate UK. Watch our video 'Celebrating KTPs - Why being a KTP Research Associate is such an exciting role' on our Vimeo channel. She added that the feedback she was receiving from businesses based in the region was there was no slowing up in their drive for innovation and growth – despite the uncertain economic climate. The celebration event was hosted by Wivenhoe House at the University’s Colchester Campus.